Place in baking pan in the oven. Listen for popping sounds. 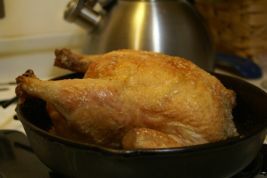 When the chicken's rear end blows out the oven door and flies across the room, the chicken is done.